Sai Baba: Help the Universe… and yourself! 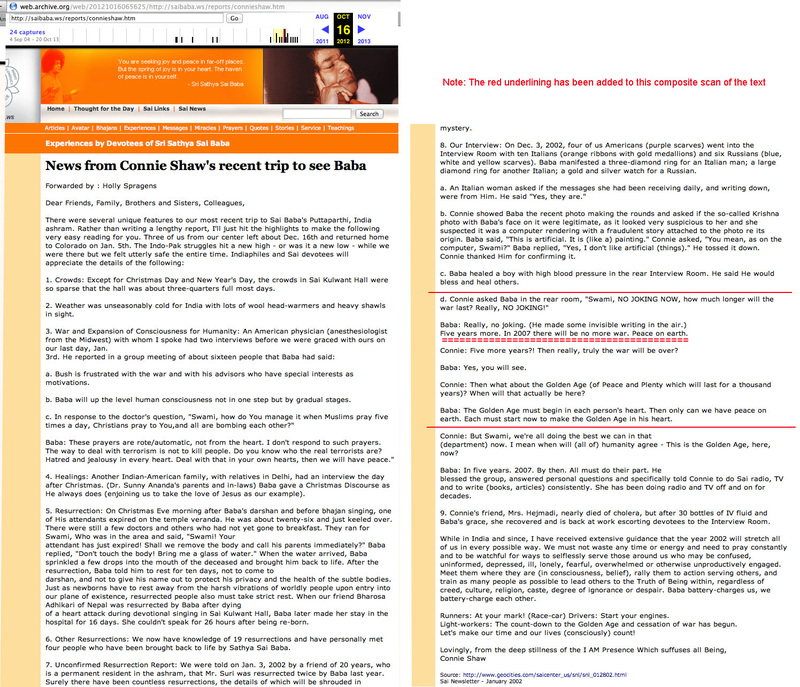 The website saibabaofindia.com has posted a letter allegedly written by Sathya Sai Baba to one devotee. 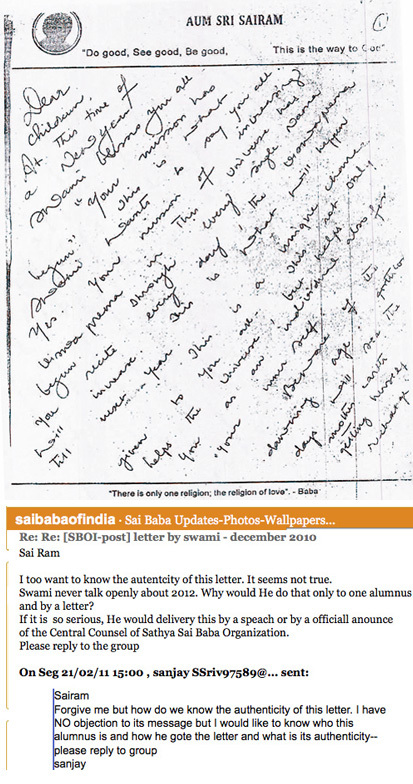 In a discussion there, devotees are thanking the one who posted it from the depths of their hearts etc., while trying to absorb what it really means… One even questions the authenticity of the letter, but then a scan of the letter is also posted and the handwriting is very clearly that of Sathya Sai Baba. Probably the letter is undated and there is no mention in it of it being written in 2010 and thus applying to 2011, as was claimed by the poster. The heading looks like Sai Baba’s notepaper from years long gone (see below). That people can take seriously such things only shows how the vast mass of devotees in India are willing and eager to believe virtually anything and accept directions of the most demanding kind as to how to live… constantly dulling their minds by repetition of names. This is a known key technique in diverting the minds of devotees from any kind of questioning or doubt about the guru and thus exerting control over them. So “Mother Earth” is getting herself recharged! But we must “Beware of the dawning age”! What, the Golden Age? All the signs so far do show that the earth’s resources are under extreme pressure, forests are being lost at an increasingly alarming rate, the atmosphere, the land, the seas and the oceans are getting more polluted year by year. But “Swami knows” and knows better than any of us is the correct answer, of course. That head-in-sand attitude is encouraged throughout the Sathya Sai Organization, even though Sai Baba has warned of the same environmental dangers in frequent discourses! But he has it all under control, don’t you worry! “Someone is in charge” he has said. However, he blames it all – including tsunamis and volcanic eruptions – on the sinful actions of humans (Is he in charge of their willpower?… He has said he cannot make people do his will!). His solution to all the dangers; “perfect surrender” to his will, constant repetition of the name and other such futile time-wasting self-hypnosis and programming. All who do so will be “white angels”, who have “to help people in distress at that time”. Why such distress if the Golden Age of perfect peace is to begin? Because not all will enter the Golden Age if they do not offer “perfect surrender ” such as by repeating the name? There is a sinister hint there, is there not? As to whiteness, does it refer to men’s cotton pyjamas at the ashrams, or how could the colour help? To what time does this refer? If the welcoming of the Golden Age has started (by Sai Baba), this is not the Golden Age itself? Your guesses are all as good as anyone’s. If you “derail” from the path, the Mother will give you bitter medicine to put you back. Sounds rather nastily threatening nonetheless, that! Consider the depth of vagueness in this: ” The distance between you and Me is the distance between you and your mind.” Whatever is he on about, it makes no sense? Does he even know himself? If so, why can’t he ever explain? False Predictions by India’s Revered “Omniscient Avatar”major parts of continents and an entirely new North Pole position. Further, a number of residents at Prashanthi Nilayam have long circulated a list of 27 highly imaginative mostly catastrophic` predictions around the millennium that Baba is supposed to have made to 18 students at Ootacamund before 1984. None of these predictions took place as stated. Sai Baba promised vast miracle soon He will lift a range of mountains to protect his devotees! The Utopian beliefs in a Golden Age, and the literally incredible ‘spiritual’ world transformation by Sai Baba and his followers, is all but a dream, no doubt highly desirable in many respects. Yet it is not easy to abandon such a dream, even when the fabric is irrevocably torn to bits and those who dare look can see through it to the reality it covers up. I write not only from personal experience but also observing many other devotees I knew from my many years of leadership in the Norwegian Sathya Sai organization going through the process and – more often – baulking at it and refusing to look at any of the extremely disturbing evidence. Sathya Sai Baba capitalises on people’s uncertainty and ignorance of anything to do with real truth by ever reaffirming to people that they are uncertain and ignorant. Sathya Sai Baba has insisted that he alone knows the right timing for everything and acts accordingly. When, in so many instances, he does not keep his word, he puts the blame on the person he made promises to for not having asked from the heart or that something about them was not genuine, or that they were simply not ready or worthy to receive his grace etc. A good headmaster of a school is just in his judgments and equal-handed in his rewards and punishments. An experienced master uses the carrot and backs it up when it fails to work by the stick. Sathya Sai Baba’s visible and invisible rewards (i.e. as promised for the future) are supposed exceed the punishments he is thought eventually to mete out to those who accept positions of trust then seriously let him down. So all his promises have to be taken in the context of this unintelligible cosmic plan which he claims alone to know and effect… and this actually makes them as unreliable in terms of human experience as anything can be. He can’t lose and you can’t win, as long as you accept his vast claims at face value! BUT the 80’th anniversary is long past – where is the instant transformation? Further Sathya Sai Baba quote on his ‘mission’: “... (the) Atma principle assumes a form from time to time for the sake of redeeming the world and establishing righteousness” (Sanathana Sarathi Sept. 1989. p. 229f and Sathya Sai Speaks Vol. 22, p. 182). He makes no secret that it is he himself who embodies the Atma principle in this era and that he is establishing righteousness… but this is strange indeed when he has strayed so much from his own teachings in so many ways, and not least when we consider the condition of Indian crime and corruption which imbues most of the politicians (according to for example, Britain’s leading Indian immigrant, the ‘curry king’ Sir Gulam Noon, MBE. India’s former Election Commissioner P.N. Seshan was even more damning of his own country’s system and includes the judiciary as corrupt and unjust to nearly all citizens).